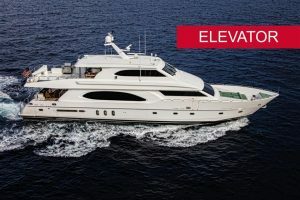 Don't miss this Fort Lauderdale Boat Show Hargrave with an elevator! : Atlantic Yacht & Ship, Inc.
Don’t miss this Fort Lauderdale Boat Show Hargrave with an elevator! Do not miss this beautiful used 96′ Fort Lauderdale Boat Show Hargrave yacht that Chris Carroll and Joe Marino have for sale with an elevator! This lovely used 96′ Fort Lauderdale Boat Show Hargrave features a one-of-a-kind option. That is a two person elevator that services all three levels. Coupled with the overall design of the yacht, this is a must-see for yachting enthusiasts. Moreover, the gorgeous Sapele wood interior looks fantastic and all the interior soft goods were replaced in 2013. Furthermore, with a convenient main-deck day head, this yacht has all the features one could ask for! This yacht with an elevator has full warranties on her twin Caterpillar diesel engines. In fact, this yacht with an elevator has a 1,400 GPD (Gallon Per Day) water maker system. Of course, she has KVH satellite TV and hydraulic bow and stern thrusters. Similarly, with NAIAD stabilizers and underwater lights the list goes on and on. Launched in 2008, this yacht has been expertly maintained by an expert crew and it shows. For more information on this beautiful used 96′ Fort Lauderdale Boat Show Hargrave yacht with an elevator for sale be sure to contact Chris Carroll or Joe Marino today! Check out this yacht with an elevator for sale in Florida! Don’t miss this Fort Lauderdale Boat Show Lazzara 116 for sale!